. . . . Someone already raised the deck. . . . .
Our friend has left the parlor, so I'll better be mild, but the picture clearly shows only the bulwarks were raised, and luckily not the decks. Even in the first post #1 picture you can look underneath the raised bulwarks to see the original deck level is still there. As originally built they had twin 6 cylinder diesels and would do about 10 knots. circa 1938 they were re-engined with 8 cylinder diesels which upped their speed to 13-14 knots. They were definitely not speedsters, but they had an impressive range of about 3500 nautical miles and were intended to go to sea and stay there for long periods. They also carried a 3 inch gun forward. During WWII they were used as sub chasers, and were used on the Greenland Patrol as well as other routine patrol duties. After the war they went back to routine patrol, SAR and few were even painted black and used as buoy tenders. They were actually pretty rugged and could take a lot of punishment. (which the Coast Guard is notorious for doing to it's ships). Most were decommissioned in the 50's and 60's so they had a long run. The one I was on, the Cuyahoga was still going util 1978. Yes, these are Active class patrol boats built in 1927. I had some information that the Morris had been re-powered w/ 2 Cummins KTAs at 575 hp max, consuming ~22 GPH @ 10 knots w/ generators running. Top weight increased w/ added armaments during the war, likely contributing to the loss of 2 boats during a hurricane in 1944. Even minus this weight, I see out-rigger stabilizers on Pacific Hunter (though they seem to be a bit far forward, no??). . . . . I see out-rigger stabilizers on Pacific Hunter (though they seem to be a bit far forward, no??). Isn't that the reflection in the water of the orange fender ? 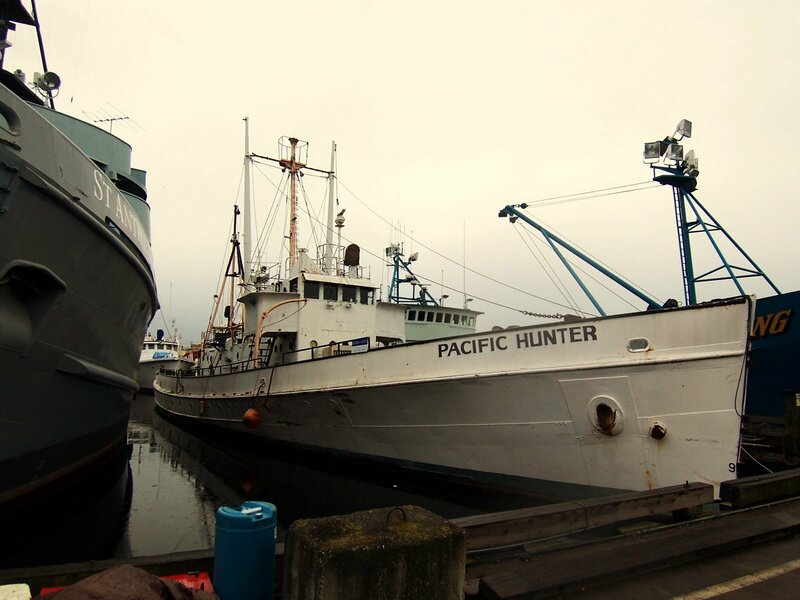 Or, if not, what do you mean by ‘‘outrigger stabilizers’’ on the Pacific Hunter ? Ship stabilizers usually are fins working only by speed, and not by buoyancy. When the ship is moving forward the stabilizer fins are automatically controlled to generate lift and downforce contra to the vessel's roll motion. When not in use they're usually withdrawn within the hull to minimize drag, and to avoid damage when docking. They don't work when the ship is stationary, as they can't generate dynamic lift or downforce then, i.e. they don't work when anchored. In post #14 I've talked about ‘‘old style stabies’’, and have put some links to extra pictures in the bottom line, they work the same as above described. Below the Costa Concordia showing one of her stabies deployed, she crushed the other one while resting on it I'll guess, since she's leaning against the rocks there . . .
She should have been named Cliffhanger, as she was very good at that, and probably saved thousands of lives by doing so on the edge of an subsurface abyss, while the captain had already fled . .
Just for the record, retractable stabilizers are typically quite large and generally found only on very large vessels. Only a few companies produce them; Blohm and Voss, Fincantieri and Denny Brown being the most notable. Also, the roll controllers typically found on yachts and commercial vessels of the size discussed in this thread (stabilizer kits supplied from ABT-TRAC, Naiad, Quantum, etc etc) are routinely delivered with a "zero speed" or "stabilization at anchor" feature. Thanks for the addition BMcF . . I thought these were best placed around 3/4 aft, where as P. Hunter's look to be near midships. May have been placed there to avoid fouling fishing gear or work space further aft. ?? Kinda confirms that these boats were "roll-y". Ha ha, lol indeed SD ! It's an example of how misunderstandings can arise, and also cleared up . . Thanks for the info, and this interesting topic ! BTW, about the paravane stabilizers, they're also convenient on a sailboat at anchor . . . .